Do you love pickles? Do they make your mouth water? Then you have to try this crunchy apple pickle! I am welcoming Fall with my favorite recipe! Indian style pickles are hot and sour or sweet and sour and are made in the summer and preserved in oil and brine for the whole year. I remember my mother making pickles in the summer. I particularly liked the stuffed baby mango pickle she made. There was a particular week of the year, very early in the summer, that she got the baby mangoes. The whole process of brining and then stuffing them with the homemade pickle masala took about 5 days and I could not wait until I tasted that freshly made pickle! Like most of my mother’s food, her pickles too were legendary and as much as I strive to replicate her recipe, it still does not taste the same. So with the arrival of fall and the fresh crunchy apples, I make the apple pickle. I like using a tart granny smith apple for this pickle. The apples tend to go soft in a few days so I make a small batch at a time. This time, I decided to make the pickle masala from scratch, in my hunt for that authentic tasting homemade pickle. The main ingredients in pickle masala are fenugreek seeds, split mustard dal and asafetida. Many times I use a store bought pickle masala which makes it even easier. I start by making the tempering as it needs to cool before adding to the pickle. 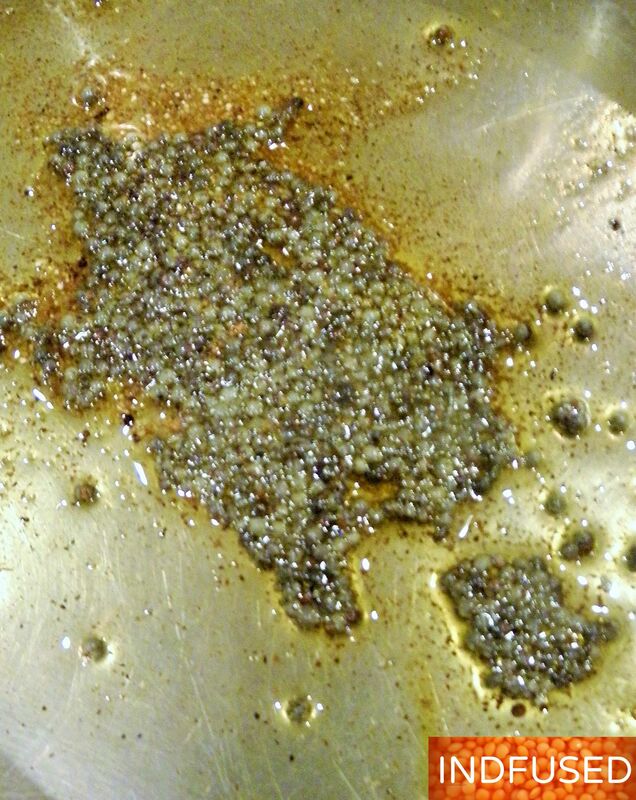 To make the masala, fry the methi seeds and the asafetida in the oil. My mother used a special Bandhani brand asafetida for pickles and I love that fragrance. So I use the same. Remove the methi seeds and grind them. Turn off the heat. In the same warm pan, roast the chili powder and add the split mustard seed dal. Combine all with the ground methi seeds and sea salt. 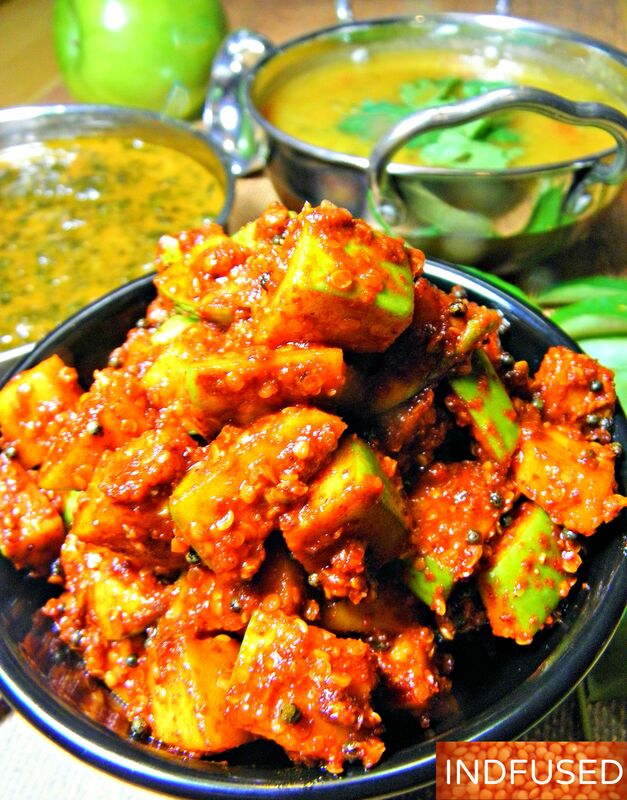 Toss the diced apple in the pickle masala, making sure it coats the apples well. Set it aside for about 30 minutes to marinate. 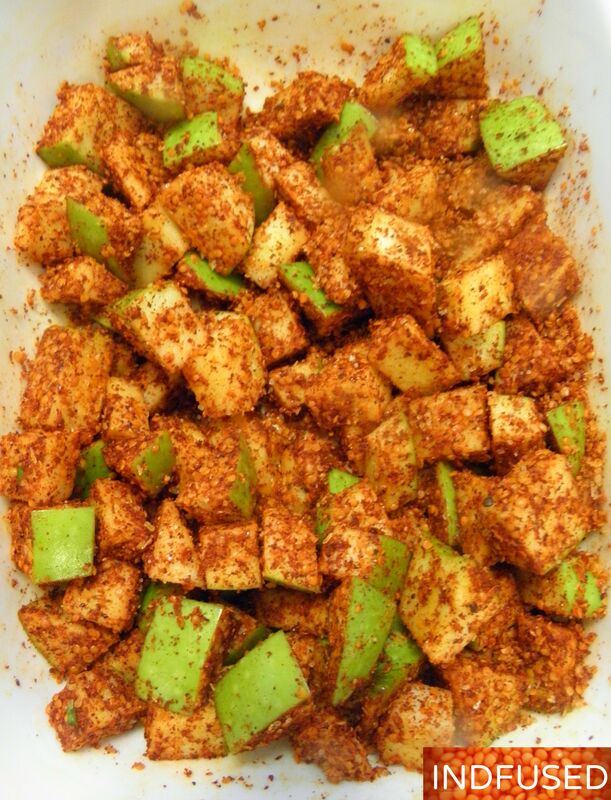 The pickle masala will absorb some of the moisture from the apples.Add the cooled tempering and stir well. In a pan, heat the oil over medium heat for the tempering. Add the mustard seeds and when they start sputtering add the powdered asafetida or hing. Fry for a few seconds or until you see the powder ‘swell up’ and become fragrant. Remove from heat and set aside to cool. In a separate pan, make the pickle masala. Heat 1 teaspoon oil over medium heat. Add the fenugreek/ methi seeds and when they are turning golden, add the asafetida or hing powder. Fry for a few seconds and turn off the heat. Remove the methi seeds for grinding. In the same warm pan, add the chili powder and roast it to liven up the flavor. Add the mustard seed kuria, mix and add the sea salt and ground methi seeds. Let cool for a few minutes. 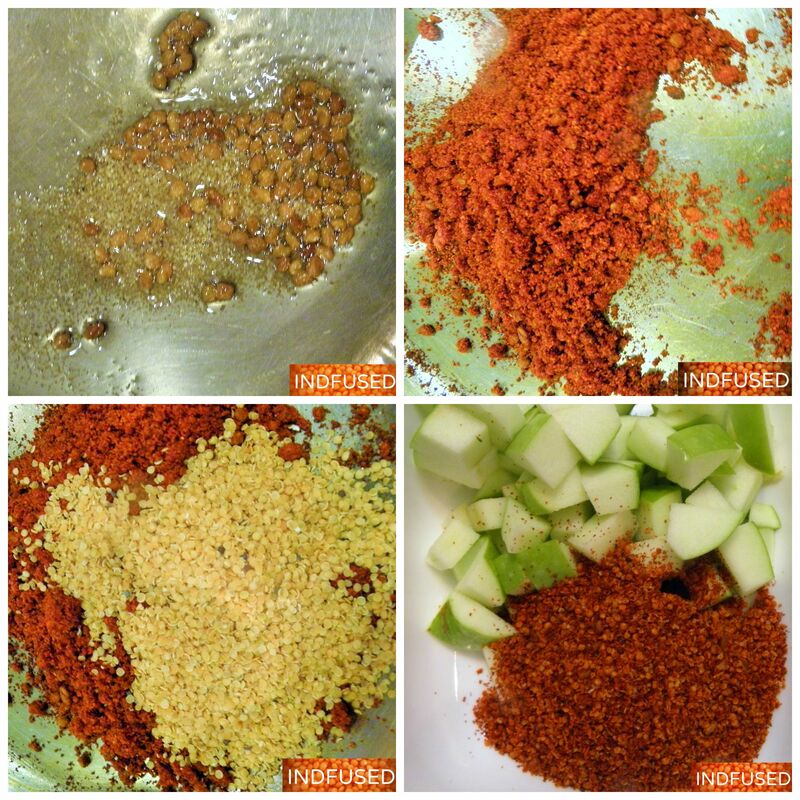 Combine the pickle masala with the diced apple, mix and let the mixture marinate for about ½ an hour. Add the cooled tempering, combine well and serve! The pickle can be made ahead and refrigerated for up to 3 days or so. My mouth is watering as I write this. Luckily I have the pickle in the refrigerator! Welcome Fall season with this Crunchy Apple Pickle! ‘Easy going’ Tadka Dal ! Arti, you will like the apple pickle. Tastes really yummy with the fresh picked apples! Wonderful and different use of apples. Looks delicious. Well done, sure will try it out soon. This looks tongue tickling good. Loved the masala that you have made to immerse the pickle in. The robust flavours of the masala along with fresh apples what a lovely and yummy accompaniment with all meals. Thank you Piyali for your sweet words. I am crazy about pickles! Wow!!!! Thank you so much! I am simply blown away by your compliments! Mouth watering dear. Pickles with apple sounds so yummy! What a brilliant use of apples around the Fall. I’m sure this tasted amazing, would love to have been a taste tester :). Yes this was much loved by all. I am crazy for the spicy pickles so make a variety of them. wish you were close by. I would be so happy to have you as my taste tester!